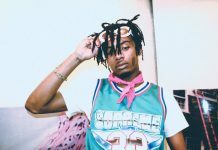 Lil Uzi Vert's Producer Claims Album is "Basically Done"
Lil Uzi Vert’s longtime producer Maaly Raw teased to XXL that Luv is Rage 2 is in its final stages. As the duo grinds “in the studio from 2 p.m. to 6 a.m.”, they’re looking to perfect Uzi’s highly anticipated debut studio album. The Philly born producer insists that the record is “about 90%” finished. Lil Uzi Vert continues to egg on his fans with tweets while him and his team strive toward reaching the secret deadline for the album set by Atlantic Records. In the mean time, Uzi gifted his fans five new songs that he confirmed won’t be on the album. With that, all things are pointing to a fall release.